Snapshot from the end of one of the atomistic simulations in which mdAE1 is embedded in a complex asymmetric bilayer (Band3_AT-1). The different lipid types are shown in different colors and the water is shown in ice-blue. 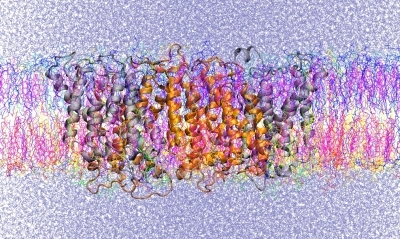 In a collaborative project started during a sabbatical leave at Oxford, Reinhart Reithmeier and Antreas Kalli (Leeds) used computer simulations to characterize the dynamics of the human red blood cell anion transport protein Band 3 in a complex lipid bilayer. The study was published on-line July 16th in PLOS Computational Biology. The simulations showed that the signalling lipid, PIP2, binds to specific sites on the Band 3 protein, a hub of red cell membrane protein interactions. Cholesterol, which is known to regulate anion transport activity, binds at the dimer interface regulating the interaction between the subunits. Glycophorin A interacts directly with Band 3 creating the Wright (Wr) blood group antigen. This interaction was simulated in molecular detail including the formation of an ionic bond between the two proteins, which recapitulated the specific Wr epitope. Furthermore, Glycophorin A dimers were able to bridge between Band 3 dimers resulting in the formation of linear protein strands of alternating Band 3 and Glycophorin A. This clustering is likely involved in facilitating the exit of these proteins from the endoplasmic reticulum, a rate-limited step enroute to the plasma membrane. Molecular dynamics simulations were able to provide molecular details of the interaction of Band 3 with lipids and it partner protein Glycophorin A, details that complement and enhance a plethora of historic biochemical studies.